This Google Maps mashup shows properties for sale or rent in the major Bulgarian towns. The map sidebar provides quick links to view properties in specific towns. Underneath the map it is possible to select which types of property you wish to view. Each information window includes a photo of the property and a link to more details. Sofia Traffic is a very useful driving directions map for the Bulgarian capital Sofia that also shows the current traffic conditions in the city. To get driving directions the user just needs to click on the map to establish their start point and click on the map again to show their destination. The map then generates driving directions for the route. Traffic conditions are shown along the route by coloured map markers. Yellow markers indicate good traffic conditions and red markers indicate poor conditions. Varna Plan is an impressive Google Maps mash-up for the Varna area in Bulgaria. Thanks to the map's impressive area polygon selection search engine it is possible to view an incredible amount of data about Varna on the map. 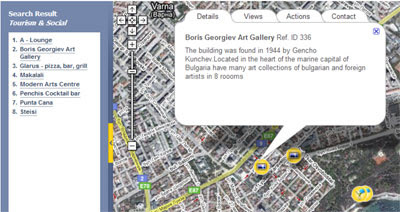 The map displays commercial, rental and residential property for sale in Varna. It is also possible to view from a large selection of tourist related layers.